Maggots are the small, slimy larvae of the common household fly, and they can grow in any region that is moist, dark and secluded. They are commonly found in the bottoms of trash cans or in an open wound on your outdoor pet. Discovering a crop of maggots can be disturbing, but because they are immobile they can be killed quickly. 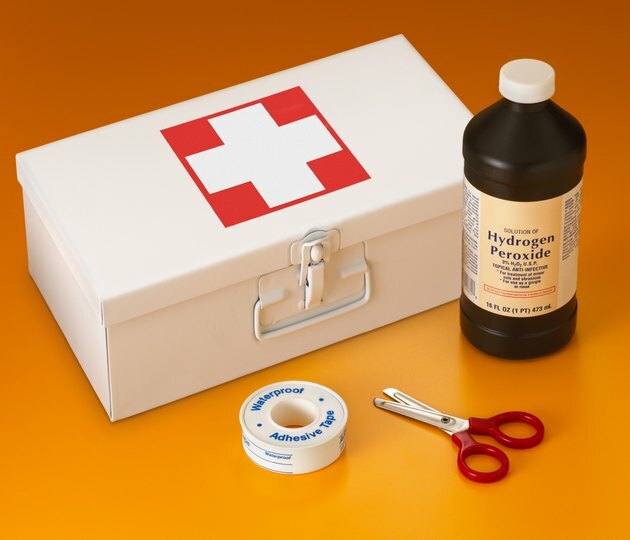 Hydrogen peroxide, a common item in most home first aid kits and medicine cabinets, can be used to kill maggots and any lingering eggs. Rid your trash can or an animal wound of maggots with hydrogen peroxide. Fill a beaker three-quarters full with pure hydrogen peroxide. Top off the beaker with fresh water and swirl to dilute the hydrogen peroxide. Depress the pipette's bulb, stick the nozzle into the mixture and then release the bulb to fill the pipette. Hold the nozzle over the maggots and gently squeeze the bulb to dispense the hydrogen peroxide solution. In several seconds, the maggots will die and stop moving. Repeat Steps Two and Three until all of the maggots are dead. Brush the maggots into a plastic bag or comb them out of the animal's fur into the bag. Seal the bag completely and place it in an outside trash receptacle. Clean the area using an antibacterial soap and warm water. If the maggots were removed from an animal's wound, visit a veterinary technician immediately.